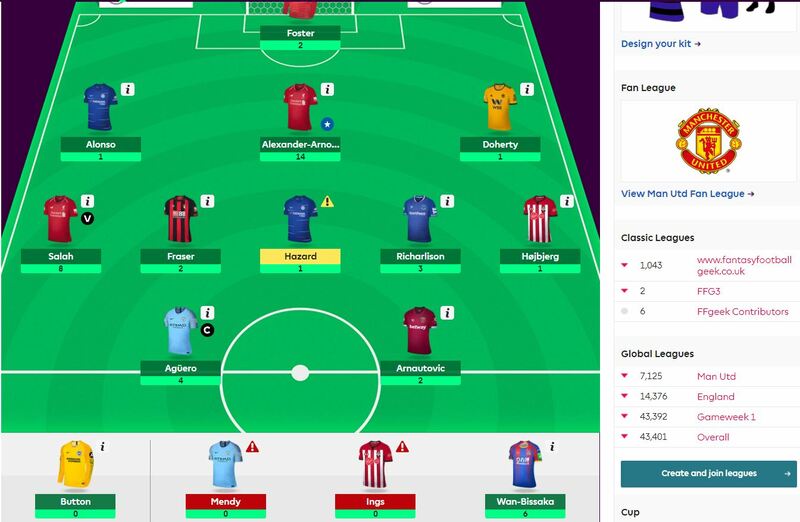 I went into GW13 in detail in my early thoughts article on the FFGeek team article so I won’t go into it too much here. So my worst gameweek rank of the season by some margin. Only 2 returning players in Alexander Arnold and Salah. However Salah returning as a captain option was probably rank damaging. The resulting red arrow could worse in a 15k drop to 43k. I transfer and £0.3m in the bank. 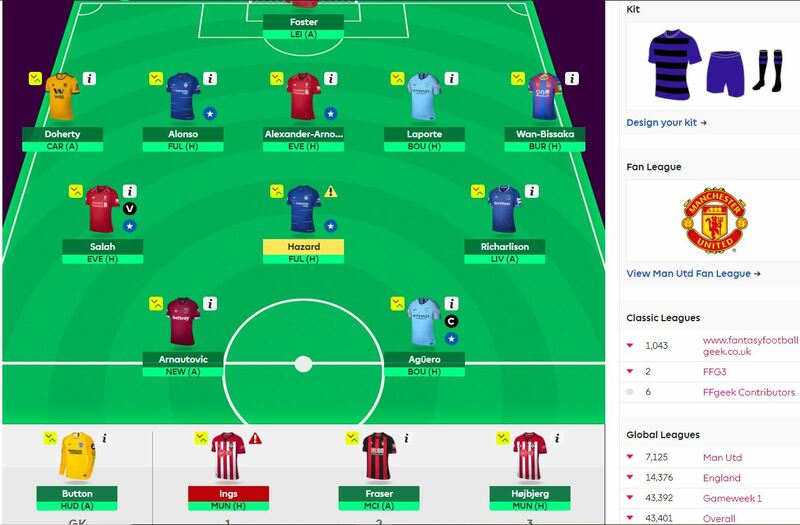 I don’t really want to make a transfer I’d rather carry one over as GW15 is potentially a very significant gameweek of change so I’d like the flexibility. However I feel that unless I sort the Mendy situation out I could leave it for too long so I’m just going to do it and transfer Laporte in. The Hazard to Sterling/ Sane transfer has alot of momentum at the moment but I can’t sell Hazard before a home game to Fulham so I’m going to ride that. I’m looking at a potential transfer next week of either Aguero to Kane and Hazard to Sane as I can’t afford Sterling. Alternatively I could do Ings to Kane and Hazard to a £4.4ish midfielder. 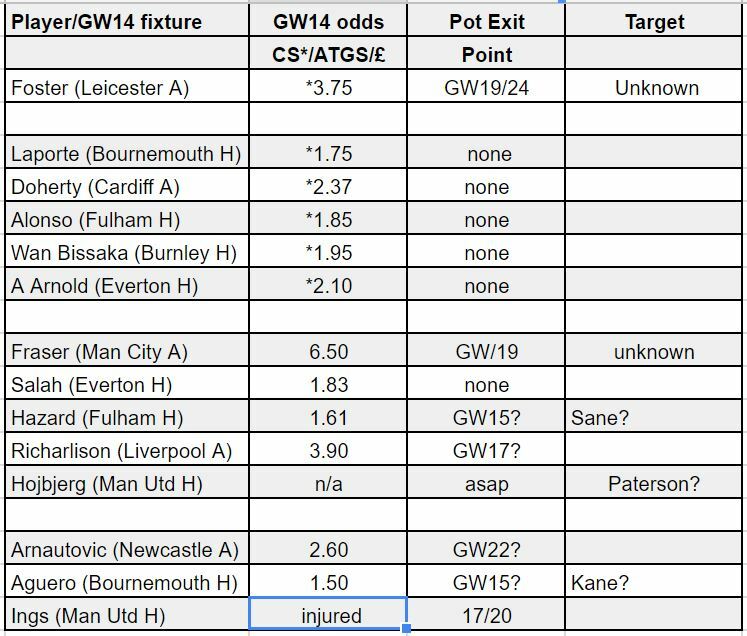 However this is all subject to events over GW14. It’s likely to be my first -4 of the season. So just to confirm the transfer is Mendy out and Laporte in. The only choice in the lineup is between Richarlison and Ings but I’ve gone for Richarlison and with Ings likely to be out it’s a bit of a non decision. Hi geek, I see you are going 5 at the back this week, I might do myself but will have to leave Jimenez on the bench to do so . My back 5 is the same as yours , do you think I should go with the back 5 or drop one of Doherty / AWB and bring in Jimenez up front? Hi mate these ones are always tricky and the answer depends on your approach. I think Doherty and AWB have more chance of returning but a striker always has potential to score more points if they do return. I think AWB has the best chance of returning and the Wolves defence is very highly owned so if it was me I would do that but you do leave your self open to a potential decent score from Jimenez on the bench. Hope that helped in some way. Good luck whatever you do and make your sure you make the decision you’re comfortable with. Nothing worse than doing what someone else would do and losing out good luck! I have a choice between going with Fraser (I can see you have him on the bench) or Dunk (defender). What do you think? Hi Geek, is your vice-captain really Salah (according to the pic)? or Hazard? So in short form if you are rocking the Laporte swap this week and taking a -4 next week then you are sort of taking a -4 to bring Laporte in. Isnt that one of your cardinal sins Amigo? lol just joking around. Good luck this week. Heres to Hazard starting and kicking for 90! Hi mate. That was only because with other stuff going on I thought that I would never get Mendy sorted out unless I did it now as a 3 month injury meant I couldn’t realistically wait it out. Hazards stats with morata on the pitch are truely shocking. Am sticking with him though.